Azerbaijan, the nation and former Soviet republic, is bounded by the Caspian Sea and Caucasus Mountains, which span Asia and Europe. Its capital, Baku, is famed for its medieval walled Inner City. The country has an estimate population of 9.6 million people with an average life expectancy of 68 years for men and 74 years for women, which is quite reasonable aligned with the development of the country. Since the CCP (Caspian Compassion Project) established aiming to promote health care activities, the association MMI Azerbaijan has developed a dedicated team of local staff that serves people in Masazır, Baku. Elena Filippova has been working with Medical Ministry International in Azerbaijan since 1996 and became the Executive Director of Caspian Compassion Project in 1999. Elena is originally from Azerbaijan and graduated from Azerbaijan State University in mathematics. Together with Tofic Teymurov, they are leading CCP and are Medical Ministry International project directors for “Eye Surgeries in Azerbaijan”. In 2001, Medical Ministry International obtained the original grant for the land purchase, clinic construction and equipment. CCP bought 3.18 hectares in Masazırsettlement, Absheron district in order to construct a new facility of its own. The clinic of CCP is located 30 min from center of Baku. It is a good facility, which was built in 2006-2007 with the support of Medical Ministry International. The building consists of two floors. There are a nice operation area and consultation rooms at the first floor, administration area is on the second floor. This project is also designed to share experience with the local doctors, both in the classroom & hands on while doing consolations & surgeries. Other local organizations like Caledonian Society, Starling Group, Garadagh Cement, and others also joined Medical Ministry International in donating for the clinic construction. Since September 2007, CCP continues its activities in the new permanent facility. Masazır is a village and municipality in the Absheron Rayon of Azerbaijan. It has a population of 3,247. Baku is the capital and largest city of Azerbaijan, as well as the largest city on the Caspian Sea and of the Caucasus region. Baku is located 28 meters (92 ft) below sea level, which makes it the lowest lying national capital in the world and also the largest city located below sea level. It is located on the southern shore of the Absheron Peninsula, alongside the Bay of Baku. Baku's urban population is estimated at just over two million people. Officially, about 25 percent of all inhabitants of the country live in Baku's metropolitan area. * Project Description: The CCP clinic is located 30 min from the city center of Baku. It is a high quality facility which that was built in 2008 by MMI. The building consists of two floors; an operation area and consultation rooms on the first floor, and an administration area on the second floor. This project is also designed to share experiences with the local doctors, both in the classroom & hands on while doing consolations & surgeries. The months of May, June, July, August and September have mild weather and temperature. Travelers must present a passport, which must be valid for at least six months beyond the date of expected departure. Travellers must be in possession of a tourist visa to visit Azerbaijan. Please check the following website for the most current entry/exit requirements. • Airport: Heydar Aliyev International Airport, Khazar, Azerbaijan. The money in Azerbaijan is called the Azerbaijani New Manat (AZN). US dollars or Euros can be exchanged for AZN. MMI staff will help you exchange money. All major credit cards are accepted - Visa and MasterCard the most widely accepted (make sure to call your credit card company and let them know that you’ll be traveling internationally). Traveler’s cheques are not easily cashed. You must bring US dollars in good condition. Torn, stamped or old bills will not be exchanged. $100 bills older than 2006 are also not accepted. 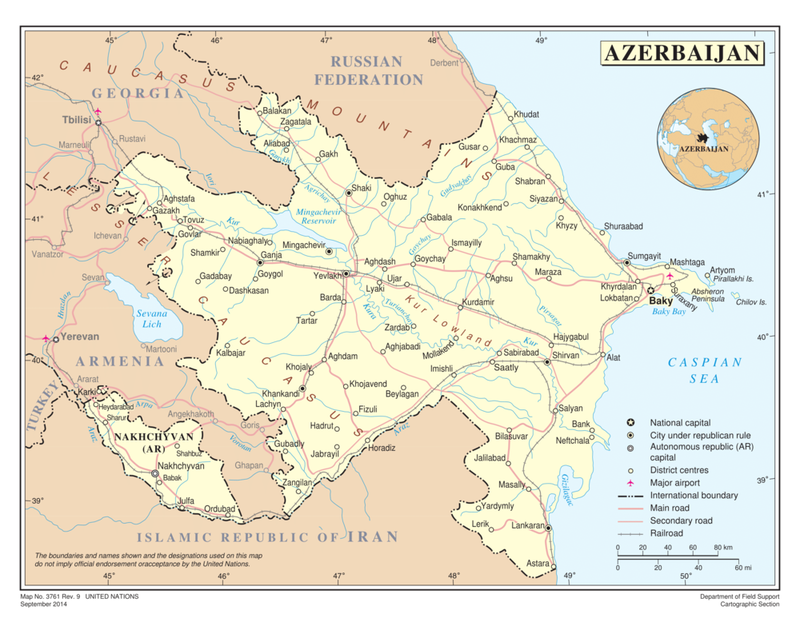 Azerbaijan - a nation with a majority-Turkic and majority-Shia Muslim population - was briefly independent (from 1918 to 1920) following the collapse of the Russian Empire; it was subsequently incorporated into the Soviet Union for seven decades. The official language is Azerbaijani (Turkic language), which is spoken by approximately 92% of the population as a mother tongue. Azerbaijan is home to a vast variety of landscapes; over half of Azerbaijan's land mass consists of mountain ridges, crests, yailas, and plateaus, and the rest of the terrain consist of plains and lowlands. The national animal of Azerbaijan is the Karabakh horse, a mountain-steppe racing and riding horse endemic to Azerbaijan. Southwestern Asia, bordering the Caspian Sea, between Iran and Russia, with a small European portion north of the Caucasus range. Large, flat Kur-Araz Ovaligi (Kura-Araks Lowland, much of it below sea level) with Great Caucasus Mountains to the north, Karabakh Upland to the west; Baku lies on Apsheron Peninsula that juts into Caspian Sea.